Your consultation comprises of an accurate medical diagnosis according to your real nature - that is, your inherited constitution given to you by your parents and the current state we find your constitution in. During your consultation all factors relating to your condition - your individual constitution, your diet, your daily-routine and lifestyle are accurately appraised and then recommendations given. No other system of medicine, past or present, as developed such a clear science of longevity. Nothing can compare to the Ayurvedic understanding of how our body and mind works in relation to who we are, and in the context of our diet, our work, family and environment. Your consultation will determine the type of 'Panchakarma' treatments best suited to your individual constitution that you have inherited from your parents. Costs of recommended treatments and time-scale will be provided for you. We can offer you the most effective health insurance you're ever likely to take out in your life. 3000 B.C. - 1000 B.C. When Sir John Marshall unearthed the buried city of 'Mohenjo-Daro' between the foothills of the Himalayas and the Arabian sea, a civilization of extraordinary sophistication was revealed. Carbon-dated at around 2,900 B.C. the ruins of the Indus River Valley showed a marked superiority over their predecessors, the Sumerians, Egyptians and Babylonians. These people of an unknown origin left an incredible legacy - an affluent middle-class suburb comparable to 20th Century suburbia. For six miles, houses were built with fire-hardened bricks - a first for mankind ! Bathrooms, latrines, waste-pipes to brick-built drains, artefacts of toys and jewellery, and for communal use, granaries and swimming pools too. 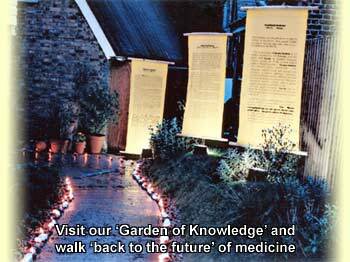 The visionary minds of the 'Rishis' or sages behind such advanced urban towns, also laid the foundations for a futuristic, natural medical system known as AYURVEDA (pronounced R-U-VEDA).